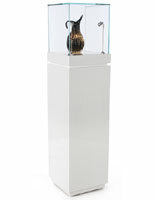 Are you in the market for exclusive museum pedestals for your upcoming event or showroom? 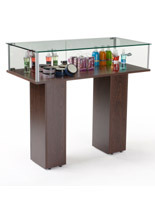 Gallery displays for commercial use is a very common practice. 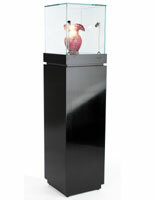 Showcases which are built for freestanding use and are designed to be centerpieces that anchor the showroom floor. 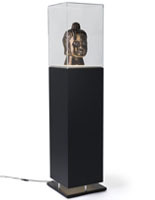 These museum pedestals, also known as gallery displays, can also be used in the home to highlight family heirlooms or personal collections. 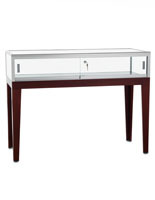 Some selections within this listing have custom lighting options which have been added to accent these glass showcases. When museum pedestals, one must first map out their desired floor pattern and choose a tall model or a wider table top version. No matter what style you should choose, the high quality designs we offer here will help accent your merchandise, antiques or awards. 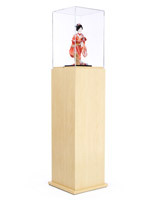 Each of these retail display cabinets is artfully crafted like they were going into a gallery. What styles and model showcases do you carry? 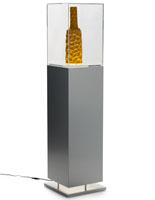 Tall rectangular models, oversized square topped units and hexagonal models. 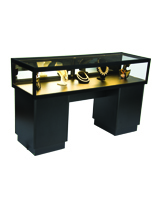 The pedestal is synonymous with high class and unique items. Society has engrained this idea into our minds and into the direct shopping culture. If an article, item or offering is put on a stand it instantly gains more respect and becomes the centerpiece of any sales floor. 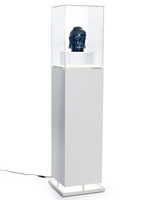 While a wall exhibition mount does well to highlight an object and protect it from dust and finger prints it is still tucked away and mounted away from the center of the room. 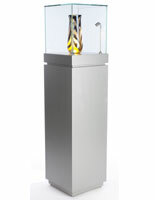 A tower showcase can be placed anywhere within a gallery, library, store or home trophy room. 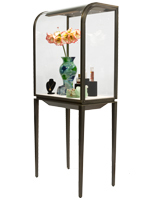 The hosted items can be even further accentuated if one chooses a model with custom manufacturer lighting. 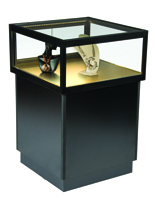 These trophy holders, relic and antique cases are both modern and elegant which is a hard combination to find when it comes to point of purchase product exhibition. With what material are these offerings finished? 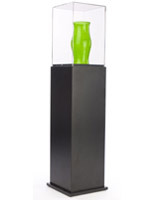 What about the personal collector who wants something to accent a family keepsake or the pinnacle of their collection? 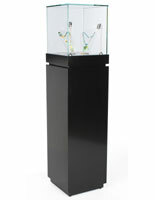 Our tower cases with acrylic showcases instead of glass are more affordable, lighter and ship broken down to save on transportation costs. 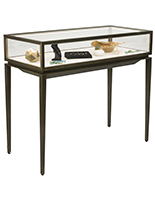 This gives the both novice and experience collectors the rewarding feeling of showcasing their wares in an elegant fashion. 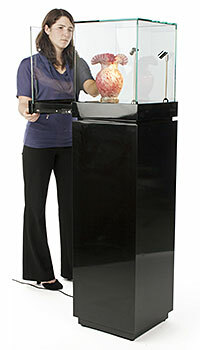 Just like the private collector the small shop can also utilize these showcases in their stores. 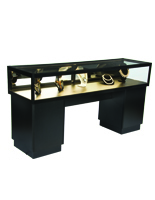 Just like major retailers and art collections small market locations can showcase their wares in style and with prominence.